Guest: 相楽晴子 (Haruko Sagara) - Actress and singer. Debuted as Okyo in a cult TV series called Sukeban Deka II in 1985 and went on to more hit roles before quitting in 1995 after moving to Los Angeles to live with her husband. 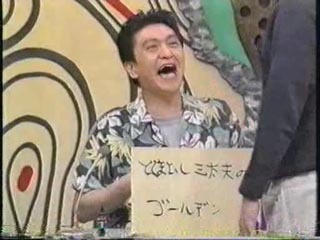 Additional Segment: Imada Koji and Yamasaki Housei do a promo for the show with a pretend battle which ends poorly for Housei.